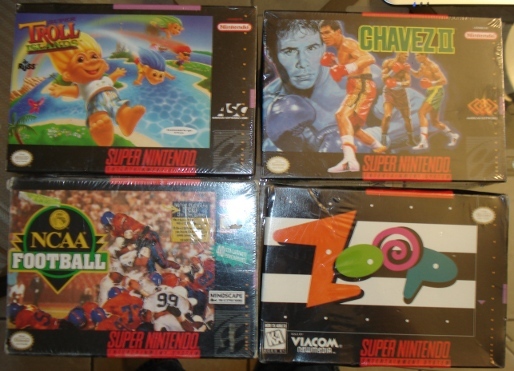 In this article, I open four sealed SNES games that I have. Thanks to skaar for giving me copies of Chavez II and Super Troll Islands! Also thanks to the regulars in #vbender on Efnet for the inspiration to do this article. One of the great thrills when I was a kid was opening that brand new SNES game for my birthday/Christmas. Whether it was a new Final Fantasy or Super Mario game, the excitement of being able to play a new game brought me a lot of joy. I do not get sealed games very often, because they usually go for much higher prices that I am willing to pay, but on occasion I get lucky. The last two sealed SNES games I opened were Rex Ronan: Experimental Surgeon and Bronkie the Bronchiasaurus. The two ASC games are in pretty good condition. I got them during the summer and they survived a flight to Sudbury and my subsequent move to Alberta. The two other games are in a more rough shape. 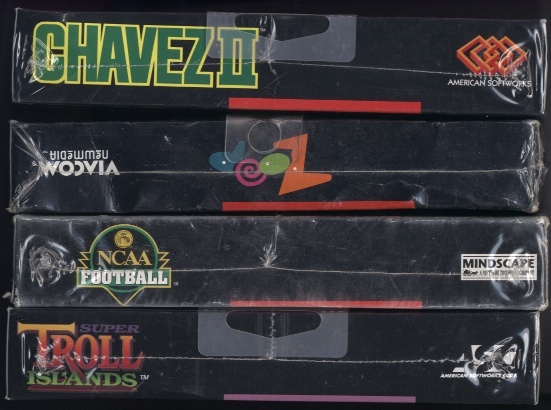 As you can see at the top of these games, there are hanger tabs on the Zoop, Chavez II and Super Troll Islands games. 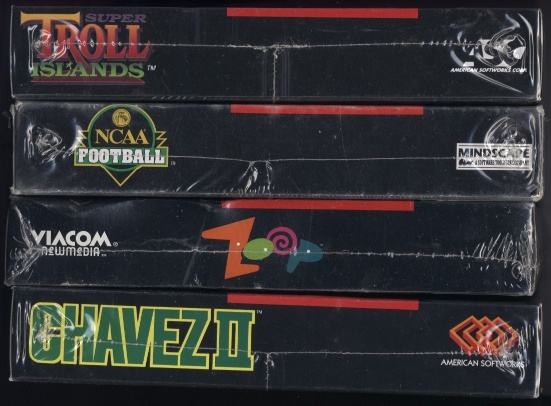 Also note how the logos on the Zoop box are upside-down relative to the other three games. How common this is, I have no idea. 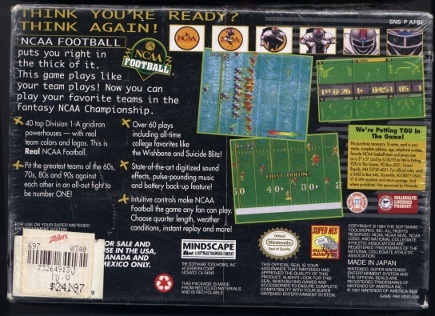 This scan of the bottom of the game really shows the seal off. The seals of NCAA Football, Chavez II and Super Troll Islands are pretty much the same, with a vertical seal in the middle. Zoop is sealed differently and does not have this vertical seal. 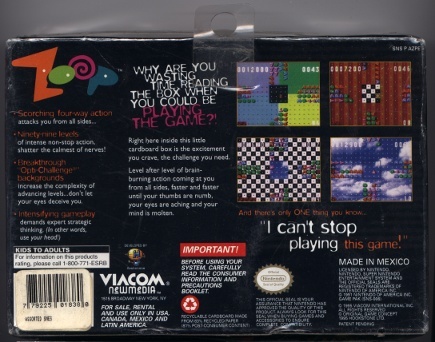 Note on the bottom of the box, the Zoop logo is oriented the same as the other boxes. 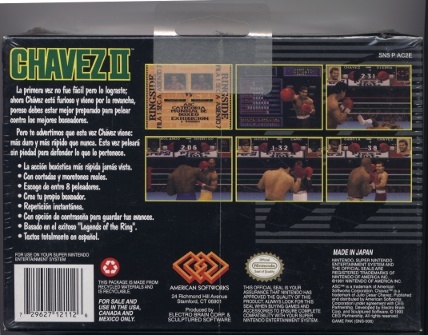 My guess is that Zoop is sealed differently because it is a "Made in Mexico" game. As you can see from the backs, NCAA Football, Chavez II and Super Troll Islands have nice vertical seals, while Zoop does not. I guess NCAA Football was purchased at Zellers (a Canadian retail chain, somewhat similar to Wal Mart), and cost $24.97. 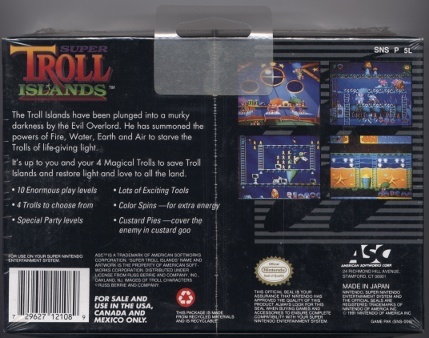 There are no price stickers on Chavez II or Super Troll Islands, as these were never sold at retail. And now for the moment you all have been waiting for, the video of me opening them! This was shot with my Sony DSC-W30 camera (I don't recommend this camera for anyone, it is terrible), and it continually goes out of focus, so I apologize for this. Well, I really enjoyed making this article. Nothing beats the thrill of opening up an older game and finding out what is inside. Here are some photos of the contents of the games.